William (Wilhelm) Louis Ipkendanz was born in Hildesheim, Hanover in 1847, and was orphaned when he was just three years old. The years in between are a mystery however, after leaving Hanover for England – some several years later - William worked as a courier at one of the bigger hotels in London. Fortunate individuals, who were lucky enough to be able to afford the ‘grand tour,’ relied on William to organise tours, look after their luggage, bookings and transport. Lina, born in Anet Switzerland, worked in one of the large hotels as well and, according to a relative, it was through the hotel connection that the couple first met. Lina would have been a great asset to any hotel because she was reputed to have spoken eight languages. The couple decided to make Australia their future home and William arrived in NSW in 1883, as a passenger aboard the Koonoowarra. He sent for Lina (nee Probst) as soon as he was settled, and she arrived in Sydney aboard the Potosi in 1884. They were married at St Mathias Church Paddington a fortnight later. She was just twenty years old - having been born in 1864 - making her considerably younger than William. Lina’s sister Marie settled in Western Australia around the same time. 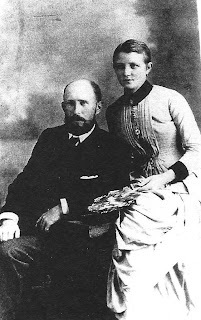 Marie married John Charles Zehnder in 1890. As a matter of interest, the surname Probst/Propst means a lay administrator of a German Roman Catholic diocese or Lutheran synod. Probst is the Swiss form and means the same, while the English term is provost, which is derived from the same origin. All come from the Latin word praepositus or preposterous. William was listed in the 1885 edition of the Sands Directory living at the Metropolitan hotel, Underwood Street, Paddington. In August, 1885 he is thought to have been the licensee of the Glasgow Arms hotel Harris Street, Pyrmont. In 1891, William applied for a Certificate of Naturalisation, which was granted on 14 August 1891. This was no doubt prompted by a Government directive requiring all residents to be ‘naturalised citizens’ before they could purchase a home or property. This of course did not apply to people who were born in the colony or who were British subjects. William’s Certificate of Naturalisation was signed by no other that Sir Henry Parkes. Following their marriage William and Lina had a number of children, they were: Hubert C. born in 1885 (d1886), Alice Marie born 1888, Arnold William born 1891, Robert Louis born 1893, Eric Pirival born 1895, Herbert Tyral born 1897 and Edward Kendall, the youngest, was born in 1899. Edward was the only child whose birth was registered at Springwood. It is of interest that Eric Ipkendanz (grandson) did not mention the birth and death of Hubert but he may not have known. Between 1885 and 1890 William and Lina purchased the Royal Exchange hotel in Silver Street, Marrickville. Various editions of the Sands Directory from 1890 to 1897 list William at the hotel, but it remains unclear when he became the owner but one could assume it occurred in tandem with his naturalisation. Incidentally, the old-fashioned term retired ‘victualler’ was used on his deceased estate records. Marrickville was the scene of severe flooding in 1889; homes were inundated under several feet of water and stranded residents had to be rescued by boat. Later, R placed a letter in the Sydney Morning Herald attesting to the generosity of the Ipkendanz family, who rendered assistance to about sixty homeless people by putting them up at the Royal Exchange hotel. Both William and Lina were praised for feeding, accommodating and clothing those in distress. A postscript at the end pointed out that neither William nor Lina had ‘any knowledge’ that R was writing the letter to the paper. A paper written by Eric Ipkendanz (grandson) stated that a richly engraved Silver Samovar was given to William and Lina later in recognition of their unselfish deed. The Samovar remains with the family to this present day. The Ipkendanz family were mentioned quite often in the Nepean Times even though they appear not to have moved to the area prior to the erection of Elmhurst. From as early as 1893, William became actively involved in the Progress Association and was often called upon to preside as chairman. He became President of the Association in 1895, and his associates at that time were Messrs Axel Bech, J.T. Ellison, A. Ferguson, D. Mutch, J. Tanner and C. Lees. During 1895, the Nepean Times reported that the Progress Association was ‘in a moribund state’ after several meetings had been postponed with the consequence that it had ‘knocked the heart out of its members’. Despite these problems, William remained a supporter of the Association well into the twentieth century, acting as Vice President in 1906 and again in 1907, when it was re-formed. Much of the family’s earliest movements are unknown but c1890 they purchased approximately seven acres of land in Springwood, from the subdivision owned by Samuel Lees MLA. Lees subdivision encompassed an earlier land grant that had been given to explorer, William Lawson. A family story suggests that the Ipkendanz family moved to Springwood because Lina missed the European climate, however, their grandson implied that it may have had more to do with the climate of Springwood and its reputation as a desirable place to live. Nevertheless, the younger Ipkendanz members spent ‘wonderful days ...roaming the valleys, learning the ways of the bush and ‘hunting for game. The erection of Elmhurst, the family cottage, began at the commencement of February 1897, and in March of the same year the Nepean Times noted that Mr Ipkendanz’s new house was being ‘pushed along rapidly’. The same article mentioned that S. Lees & Co. obtained the contract for carting the bricks and material from the railway station and, according to information obtained from their grand-daughter, the builder was a Mr Sam McGee. 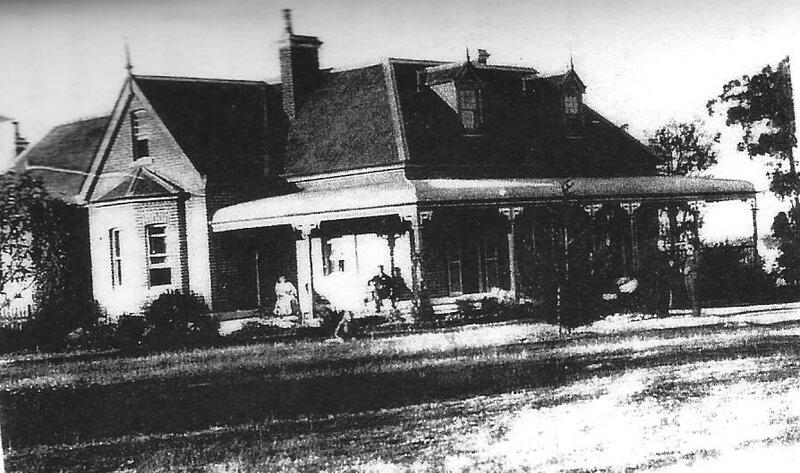 By July 1897 their new home was almost ready because the Nepean Times informed readers that the Ipkendanz family were staying at Stefanson’s - an adjoining property on Hawkesbury Road - until the cottage was complete. Lina lived in Elmhurst with the children while William commuted to Sydney whenever the need arose. Like most families in those days, the Ipkendanz family had their own kitchen garden and a cow. A small mixed orchard was also developed on the property for their personal use. As the 1890s drew to a close, William chaired a banquet at the Royal Hotel that was being held for ex-MP, Mr T.R. Smith. Among the notables who gave their apologies for non attendance were Edmund Barton and Thomas Ewing MP. Elmhurst had a narrow escape from bushfire damage in 1898, and William lost some valuable dogs after they had taken poison bait. The culprits, Messrs Olsen and Rayner, laid bait down to keep the dogs away from a sheep paddock adjacent to the Ipkendanz property. Undoubtedly, some strong words were exchanged between the men; however Rayner and Olsen maintained they posted notices of their intent. Worse was to come however, when another of William’s dogs had to be put down after taking a bite out of the local postmaster, Daniel Parker. The Ipkendanz children attended Springwood Primary School, according to anecdotal information supplied by long-time resident, the late Miss May Wiggins. Later, Robert received his secondary education at Fort Street and is said to have travelled down by pushbike every Monday. Given the state of the roads at that time however, it is more likely that he rode his bike to Springwood station and caught the train to Sydney. During the week, before he returned home on Friday, Robert boarded with brother Arnold, who was doing a Maritime Engineering apprenticeship course at Morts Dock in Sydney Harbour. This fact seems to be confirmed by information in the Sydney Morning Herald which stated that Arnold passed first year fitting and turning at Technical College. Arnold went on to become Chief Engineer for the P & O shipping line. Perhaps due to his early experiences Robert became a keen cyclist and took part in many of the bike races held in the Blue Mountains. After Elmhurst was sold to Cardinal Moran, who founded the Catholic training seminary St. Columba’s College, the Ipkendanz family moved back to the city c1909. They moved into the cottage ‘Bulwarra’ located at 77 Lucas Road Burwood. The home was sold in 1933, after the deaths of William and Lina. However, their attachment with the Mountains remained because Mary Alice Ipkendanz married Thomas Ashcroft (Springwood butcher) in 1912. They had three daughters Jean, Gwenda and Valmai. Edward married Jessie J.G. Watson, daughter of Mr Watson, of Watson & Crane, in 1927, and they had a son Graham. The Watson family also had property in Springwood. Herbert Tyral married Daisy Nina Morse and had children John and Jill. Arnold never married and Robert married Florence May Kerney in 1919; their children were Joan, Eric, Rita, Marie and Margaret. Additionally, the family purchased land in 1911 from a subdivision called Springwood Heights Estate on the corner of Railway Parade (now Macquarie Road) and Stanway Avenue, where the cottage known as Urunga, was built in 1912. Owning several allotments gave the family room to build a tennis court. This home was sold after the death of Lina. Wales until enlisting in the army for World War One when he was twenty one years old. He served with the 7th Light Horse and died in 1948, aged 53. Sadly, son Eric, who was a Lance Corporal in the Australian Army, died in France in 1917, while fighting for the 55th Battalion. He was only 22, and is buried in Bapaume Cemetery in France. Lina seems to have been a great correspondent and hold very forthright views, which can be gleaned from several of her letters that appeared in the Sydney Morning Herald. She had strong views about military defence and, using the example of Switzerland, suggested that every able bodied male in Australia should take part in ‘military training for a certain number of years.’ She even forwarded a copy of the latest military defence book from Switzerland to Senator Pearce before he embarked for the ‘Washington Conference.’ Lina considered that a period of military training would engender patriotism as well as support the British Empire in their bid for world peace. 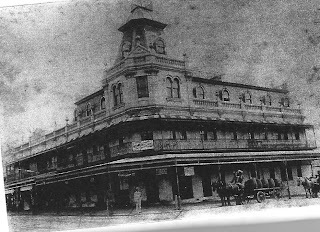 When William died in 1923, he still owned the Royal Exchange hotel and several shops in Marrickville. All the shops were rented out but the hotel had ceased to function. According to their granddaughter, the remaining family members formed a family company to manage the remaining business interests after William died. William and Lina are both buried in the Church of England section of Springwood Cemetery. He died aged 76, and Lina aged 66, in 1930. Arnold died aged 82 in 1973. Herbert Tyral Ipkendanz died 6.7.1970, and is buried in Boggabri Cemetery with wife Daisy Nina, who died 5.10.1970. Elmhurst which served as the sister’s novitiate, then as a Presbytery, and lastly as the administration office for St Thomas Aquinas Primary School, is a sad reflection of a once family home and sits falling into decline. Urunga still exists although the land has been reduced in size since the occupation of the Ipkendanz family. St Columba’s College closed as a teaching seminary in the 1970s. St Columba’s High School, St Thomas Aquinas Primary School and Church now occupy the site. Royal Exchange Hotel still exists. Personal interview between Pamela Smith and William and Lina Ipkendanz’s grand daughter, 1999. Eric Ipkendanz, ‘A Record Of Our Life And Family,’ 1999, p. 1. Eric Ipkendanz, 'A Record Of Our Life And Family, 1999. Sydney Morning Herald, 20.8.1885, p. 7. Certificate of Naturalisation, State Records, Kingswood NSW. Barrier Miner, (Broken Hill), 28.5.1889, p. 3. The Making Of A Mountain Community: A Biographical Dictionary of the Springwood District, Springwood Historians. Sydney Morning Herald, 4.10.1922, p. 14.